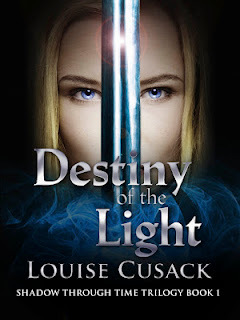 DESTINY OF THE LIGHT by Australian author Louise Cusack is book one of a three book trilogy. It's a fantasy romance weaved at the fantasy land of Ennae. Tallis is the champion to the twin prince and princess. When war broke out he transports them to another world which they know as an illusionary world, Magoria. Which in fact is our Earth. When the time comes the prince returns and is made the King of Ennae. Now when his twin sister returns later, though twins she is older as time moves faster on our earth than on their world. Tallis falls for our princess, Khatrene. But as her destiny is to give birth to a child who will join the four worlds, she is married to the Dark. It is a saga of forbidden love. Betrayal, honor and family. Tallis is a noble hero. And Khatrene is a strong heroine who was brought up in our world but adapts to life on Ennae and all it's magical powers. Louise Cusack's superb storytelling makes these characters stand out and the whole story is very visual. I'm looking forward to getting into the second book in this trilogy. As a reader what I love about these series is that though it depicts other fantasy worlds, you are not thrown out of the story by other world languages. The author explains this away by explaining that their mind adapts to our language for them to converse with an Earth being. DESTINY OF THE LIGHT is an exciting, fantastic, tale which will grip you from the very first page and keep you flipping your ereader pages late into the night!